Turtle Beach has announced that it has sealed a partnership with Sony that means it will be releasing a new range of PS4 compatible headsets this year. The licensing agreement means that Turtle Beach will be looking to fill the minor void where PS4 headsets are concerned, following Sony's decision to move to an optical input. 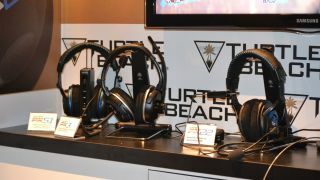 In a busy week for Turtle Beach, it showed off its new HyperSound beam technology - which apparently focuses a beam of sound at you for a different sonic experience, and announced a slew of new headsets. Those include the Z60 PC gaming 7.1 offering and forthcoming Titanfall headsets that will tie in with one of the most eagerly anticipated of the next-gen games. Along new versions of old favourites there's also a PS4 upgrade kit for those people who want to convert their analogue headsets to the new optical port on the console. That comes in the form of a USB powered converter which takes the audio from the optical SPDIF connection and outputs through a 3.5mm stereo jack. It comes bundles with a chat cable and will be available in Q2 this year.